Nothing quite bewitches the senses like a burning candle. From the warm, flickering glow of the wick to the intoxicating scent that casts its enchanting spell over the room…it’s almost magical. Candle Bar make the kind of candles that will in one breath delight and in the next hypnotise. Based right here in Sydney, Candle Bar boutique candles are hand-poured from soy wax and are free from chemicals – so you know each enticing whiff is completely natural. With a number of fragrances within the range, each organic candle is triple-scented and housed in a sleek glass jar. From fresh florals to sparkling citrus notes, Candle Bar concoct all manner of intriguing fragrances and make them their own. In fact, when someone lights a Candle Bar candle it’s almost instantly recognisable. Presented in a glass jar and topped with a polished silver lid, the Eid Mubarak Candle is adorned with the Islamic star and cresent as well as the phrases ‘Eid Mubarak’ and ‘Eid ul-Fitr’. 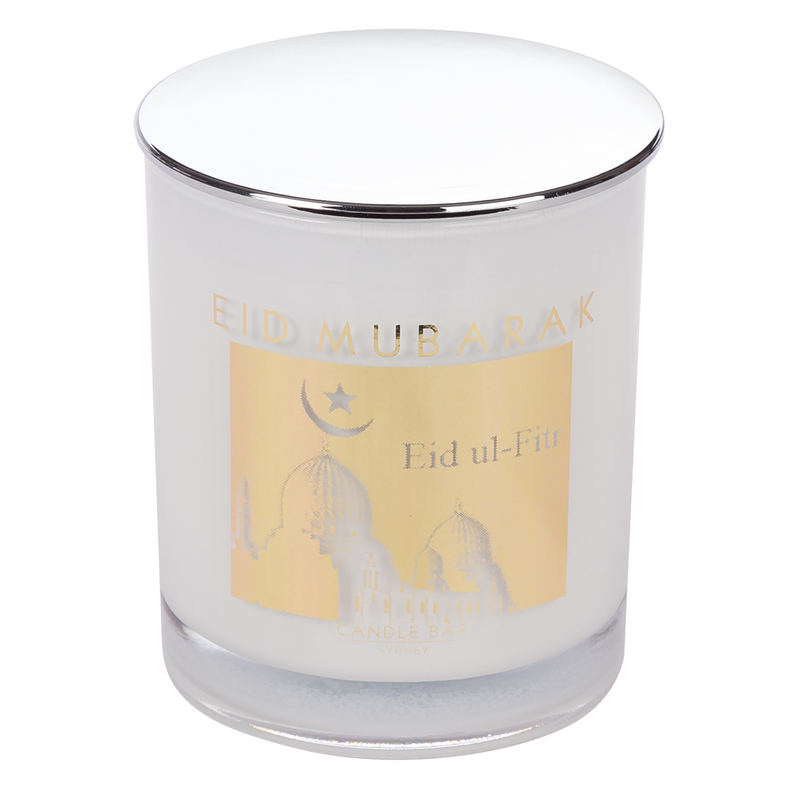 Beautifully scented and presented in a Candle Bar gift box, this candle is perfect for celebrating the end of Ramadan. Topped with a polished silver lid. Housed in a glass jar adorned with ‘Eid Mubarak’, ‘Eid ul-Fitr’ and the Islamic star and cresent. Perfect for Eid ul-Fitr, the celebration that marks the end of Ramadan. Presented in a Candle Bar gift box. Dimensions: 10.5cm (h) x 9.5cm (w).